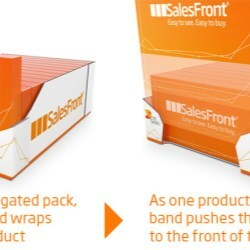 The SalesFront pack incorporates a specially engineered band into a retail-ready corrugated pack (RRP), which smoothly moves the contents forward as each item is sold. 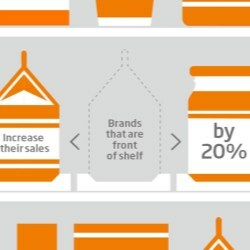 Research from IGD has revealed that 37% of customers will buy an alternative brand if they can’t see their chosen product on the shelf, while retail trials have shown that sales of a product continually presented to the front of the shelf can increase by up to 20 per cent, with an average increase of six to eight per cent. SalesFront will help manufacturers and retailers combat the problem of poor on-shelf availability, without the need for additional equipment on the shelf or for employee time spent manually pulling products forward. Not just a pack design, SalesFront is a packaging system and DS Smith has developed a range of equipment to assist the assembly and filling process. 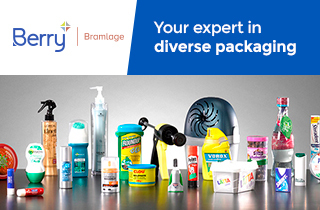 When the pack is erected, the band is stretched and the product is loaded on the customer’s specially adapted packing lines. DS Smith has appointed Isabel Rocher, former head of EU packaging and shipping supplies at Amazon, to lead its new specialist e-commerce team. Here at DS Smith we are currently #rehearsingthefuture - a process where we’ve created possible scenarios for the future (NOT predictions) to help us debate and shape the trends and issues that we think will have an impact on us, our industry and society as a whole in the decade to come. DrankDozijn.nl (A Dozen Bottles) is a digital liquor store based in the Netherlands for the true connoisseur of spirits. E-Commerce specialist Kees Kraakman of DrankDozijn.nl explains: "We offer an extensive range of whiskeys, wine, gin and rum. At the lowest possible price and with the best service." Norwegian Prime Minister Erna Solberg was at Oslo’s Gardemoen Airport recently admiring King Crabs nestled in DS Smith's award-winning Drypack packaging prior to their export overseas. The Career and Education Fair (Bildungsmesse) was held in Fulda on February 28 & 29, 2016 in the congress hotel Esperanto. The fair attracted around 12,500 visitors on both days. It was an excellent platform for DS Smith to present itself as an attractive regional employer and vocational training company as well as for young professionals to showcase their talents to potential employers. You spent millions of euro and years developing your product, refining the marketing, developing relationships with logistics firms, distributors and retailers – after all that investment doesn’t it make sense to ensure you know where your product is at all times? DS Smith is on Instagram! We make and do some amazing things here at DS Smith. We also have some pretty amazing people. So we recently created a DS Smith account on Instagram so that we can share a bit more about what we do in the office, and what we get up to when we’re not pursuing our passion of packaging. Once again, a tombola for a good cause has taken place at the DS Smith site in Fulda. There were great prizes to be won by participants. The "Kleine Helden" (Little Heroes) society is the beneficiary of the proceeds. Kinder- und Jugendhospiz Osthessen e. V., a hospice in the Hesse region of Germany, looks after children and young adults with life-shortening illnesses along with their parents and siblings. We’re very proud that DS Smith has achieved 72.5 % of the total achievable scores in WWF´s Environmental Paper Company Index (2015) for its packaging division, and 100% in the responsible fibre sourcing subcategory. Our role as a leader in the packaging industry is built on providing packaging that performs to exceptional standards; something that is only possible if we protect and maintain our forests. The best way to maintain our forests is an all-out devotion to recycling. A gift should look beautiful, right? When you give someone a nice present you want the outside to reflect the time and effort you invested in the gift, right? Gift packaging from DS Smith can ensure your gifts convey just the right message! DS Smith welcomes the Circular Economy Package from the European Commission but believes it should be more ambitious. For many people, Christmas is a time for giving presents in order to allow others to feel joy. This year, for the second time, DS Smith has decided to make a donation of 50,000 euros to the UNICEF charity campaign 'Donations. Instead of gifts' instead of giving its customers Christmas gifts. The money is used to help refugee children. It is a rare thing to take an everyday object, like a corrugated cardboard box, made and used billions or trillions of times and make it better. And yet that is exactly what our Packaging Machinery team did when they invented Mandrel technology over 20 years ago! The customer event „Packaging Printing – From final artwork to print result” took place in the PackRight Academy of DS Smith Fulda at the end of October. The seminar provided a wide overview of the different printing processes. 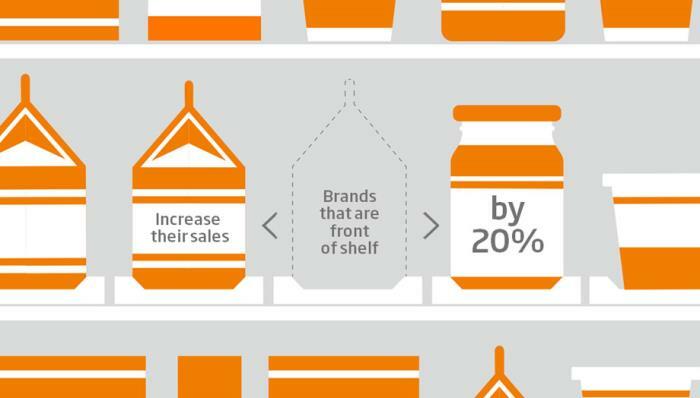 Alan Potts, market & product development director, of DS Smith’s UK packaging division recently explained to The Grocer how brands can ensure their e-retail packaging stands out to online shoppers, whilst still maintaining those vital protective elements.